Smuts invented the word holism to express ‘a blending and ordering of multiple elements into new unities’ (p. 228). Its character is both general and specific or concrete. The holistic paradigm is characterized by a pluralism of approach and interpretation, but aims at a synthesis leading to unity. Holism is, in a modern interpretation, a delimited, ‘Fourth-Quadrant’ view on the First Quadrant. It is, at scrutiny, a highly interesting unfolding of human thoughts, because it reveals the deeper mechanisms of higher division thinking. We will follow Smuts in this subdivision of holistic thinking, in order to understand his intentions with regards to the Whole. The aim is to establish a position of the Whole within the quadralectic framework. The leading hierarchical agent in the division is a growing ‘humanization’ of matter, revealing a two-fold base (of material versus non-material or mechanic versus human/life). Smuts’s outlook had, in that respect, an anthropocentric nature: Man is the ultimate creation in the universe. The various steps in this hierarchic ladder will now be examined to find the main elements in this line of thinking. Smuts was fascinated by the discovery of radioactivity (by Becquerel in 1896) and its implications for the nature of matter. The atom was no longer indivisible and could break up spontaneously. The ‘physical mixture with a negligible structure’ provided the ‘soup’ in which chemistry (as a study of qualitative and quantitative proportions of matter) and biology (as the study of life) became really possible. The internal activity of (physical) matter holds the key to its self-creation. The recent knowledge (of radioactivity) pointed – for Smuts – to the physical nature of matter. He mentioned that carbon, for instance, could be found as either coal or graphite or diamond. The modern molecular approach learned that these appearances were caused by a different internal arrangement in the spacing of the atoms. The structure of physical matter became even more important in organic chemistry. The chemical formula will no longer be sufficient to indicate a particular compound. Its representation often needs a diagrammatic and/or three-dimensional model to make a sensible distinction between atom configurations with the same formula. The following level in the holistic evolution comprised the chemical amalgamates, ‘where the structure is more synthetic and the activities and functions are strongly influenced by the new structure and can only with difficulty be traced to the individual parts.’ Apparently, the physical soup had brought out a different arrangement, due to an internal order. Energy units arranged themselves into a chemical compound or a crystal or a colloid. By doing so, it displayed an element of creativity that supports Smuts’ ideas about a tendency towards wholeness. Unfortunately, at this crucial moment in his line of thinking, Smuts did not elaborate on the principle of division. How is it possible to recognize the emerging structures without a definition of the setting in which the observation takes place? He accepted the ‘new order’ as an innate property of the (physical) material, rather than the result of a change in division-thinking. Instead, he placed all the emphasis on direction and movement (towards the whole). ‘This capacity of direction is as a phenomenon and as a fact of universal observation beyond dispute.’ Rightly so, but this dynamic capacity is meaningless without a clear statement of the conceptual (division) environment. Organisms, as the next step in the (hierarchic) ladder of humanization, mark the crossing of the boundary between dead material and life. Smuts focused on the cell as the elementary unit. It is ‘the second fundamental structure of the universe’ (after the atoms) and the origin of life. There is, in many ways, a resemblance between the behavior of cells and atoms. They accumulate and divide, grow and break. Cells develop into multi-cellular organisms and the division of cells, as it occurs in growth and reproduction, may find its origin in the breakdown of cells or groups, which had become too complex to be stable. The quintessence of this vision lies in the appeal to think about a higher division level and to see ‘unity’ as an element of a greater universe, which includes itself (as a ‘whole’). ‘Wholes are not mere artificial constructions of thought; they actually exist; they point to something real in the universe, and Holism is a real operative feature, a vera causa’ (p. 85). However, a cell differs from an atom or molecule. The cell has a system of co-operation among its parts, which make them function for the whole. An organic body often consists of an indefinite number and variety of cells, which all have to work together in order to sustain the ‘life’ of the individual. In itself, they are immensely complex organizations, which match ‘the wonders of the astronomical universe at the other end’. The protoplasm in the cell is the basis in a process of constant growth and renewal, whereby material is transformed and assimilated. But at the same time there is a breakdown of substances. This process of metabolism, with its form of control, marks a borderline between the living and non-living matter. The origin of life is in the cell. It could be found in the division of the first cell. ‘This original haphazard division would gradually become stabilized and standardized, so to speak, until cell-division becomes the regular basis not only of all growth but also of all reproductive processes in both plant and animal’ (p. 71). Smuts was eager to apply his holistic theory to the development of life. He found in Darwin’s conception of evolution or organic descent (in Chapter VIII: Darwinism and Holism) a challenging lead. Darwin was, according to Smuts, rather vague on the first aspect (of variation or inner creativity). It included, in Darwin’s opinion, not only inborn variations, but also individually acquired modifications, which turned in time to specific characters. The inner factor of variation had in general a positive and creative direction. The external factor of natural selection, which operates selectively on slight variations, was much more familiar to Darwin. The meticulous description of examples of this natural discrimination was the backbone of his book ‘The Origin of Species’ (published in 1859). The inevitable conclusion was drawn, in particular, by later followers, that natural selection was essentially a negative and destructive process. The mind is, after the atom and the cell, the third great fundamental structure of Holism. Smuts regarded the mind as a holistic structure, which performs the organic regulation and has a relation to other earlier holistic structures. It is the supreme organ which controls all the other structures and mechanisms. ‘Mind is not yet the master, but it is the key in the hands of the master, Personality.’ (p. 225). It holds the secret to freedom. It seems as if some sort of early pleasure-and-pain principle rules the subsequent development of the Mind in the living bodies. The evolution started as a vague sense of irritation, which was counterbalanced. The removal of strain subsequently led to a sense of ease and comfort. And the experience of a positive response became finally the generator for a further development of life, in Smuts’ view. Feelings (of comfort and discomfort) were seen as the critical components in this process. This oppositional line of thinking echoes the influential doctrine of the Greek philosopher Epicures (341 – 270 BC). He did not specifically search for truth (in philosophy and/or in life), but for a state of well being (searching for the positive response). Truth, in his opinion, was a matter of sensation: whatever we experience is true (BAKER, 1947). This statement puts a major emphasis on our feelings as an instrument to generate happiness. Any discomfort (or pain) could be neutralized in the reestablishment of the equilibrium of pleasure and pain. The ideal situation was called ataraxia, a state of sufficiency and satisfaction. Next there is a universal side of the Mind, which participates in a wider setting of multiplicity. But there is also an individual aspect, in which the mind is part of ‘a harmonious co-operative ordered structural unity.’ The conscious Mind is as an organ of wholes, which is geared towards co-ordination. It ‘runs through the psychological functions from the beginnings of attention and passing through sensation, perception, imagination, conception and on to judgement or reasoning’. The yardstick in this gradual progress is an increase in order. Regulation, co-ordination and control are the instruments to make that order more effective. The personality is the final step in the progressive phases of reality: the crown of humanization, or the last link in the chain from matter, life and mind to personality. This new entity is groping backwards in the mental or spiritual sphere and further into the organic and material world, but it also adds something more to the chain. It can be noted that the previous four stages were described as multiplicities while the fifth and final item in the chain of holistic progress is a singularity. This time the road of dualism seems to be abandoned. Smuts insisted that it is wrong to see the human personality in terms of separate spiritual and material entities. The division leads to an erroneous attention to one of the parts, as many examples in the history of philosophy can prove. The interrelation between the Mind and the Body gave rise to all sorts of theories, but they missed the point, because their initial setting within an oppositional framework was wrong. Obviously, the greatest culprit was Descartes, suggesting an anima dwelling in a corpus. According to the French philosopher, there are two distinct separate res or entities, the res cogitans and the res extensa. The tension between these two states causes the problems and contradictions in life. Smuts also pointed to Berkeley and Geulincx, who tried to bridge the gap by proposing God as a medium. Gottfried Leibniz suggested a pre-established harmony, and Spinoza came up with one substance underlying the mind and the body. They are all solutions to a problem that does not exist in the eyes of a holistic observer. What we do need, is a new relativism of our own arguments. There should be no Cartesian inclination to assume that the order we make of events and the interpretation we give them is ‘correct or incorrect’. In fact, it has now to be understood, that the very concept of correctness belongs to the realm of oppositional thinking and dualism. The holistic paradigm is born in an environment of multiplicity. Many options are open all the time, and the most convincing one is chosen. Selectiveness is the fundamental property of all organisms. It is the most primitive property of life because it is so close to the selective power of matter. ‘When we focus on our own culture’s process of making order’, CRAIGE (1988, p. 111) stated: ‘in our ‘reconnection’ of res cogitans and res extensa, we may acknowledge that since the understanding we have of our world depends upon our particular processes of investigation, we need a multitude of interpretations.’ Any personality that can find its way through the staggering variety of multiplicity, in freedom and purity, can be called holistic. Smuts’ introduction of the personality-as-a-whole is full of good intentions. He believed in the possibility to establish a science of Personality. In fact, ‘the science of Personality may be the very keystone of the arch, and serve to complete the full growing circle of organised human knowledge.’ The new discipline of Personology should combine the analytical contributions of psychology and physiology with other human sciences in order to place the individual character in a wider scope. This might include, but is certainly not equivalent to, the present interpretation of this neologism by the Beverly Hill-based psychic George Roman, who applied the term for face reading and the interpretation of face language. The study of biographies, as examples of personal Holism, is recommended by Smuts to discover the laws of personal evolution. These descriptions of interesting people should not be ‘the empirical unsatisfactory patch-work affair which biography now mostly is’, but provide a theory of personality. The lives for such a study, as may be expected in a holistic environment, should be chosen with care. The type of personality without the capacity for inner growth and with an arrested development is not suitable for a treatment in the Personology. Also the class of persons with only an external character do not provide good material. The absence of inwardness and an inner spiritual life by many public men, administrators and businessmen absorbed in the practical site of their affairs, make them poor study objects. However, people with real inner histories and a continuous development do have the necessary ingredients to reconstruct their lives in the light of a holistic context. Smuts pointed to poets, artists and writers as the most suitable persons to employ in a holistic study. In addition, religious and social innovators, with a more or less faithful record of their actions, offer the opportunity to study the laws of growth and development. Finally, the personality, as the most holistic entity in the universe, is put into action, as an active shaping factor in the life of the human individual. The main characteristic of the personality is its self-realisation: ‘the end of a whole is more wholeness, in other words, more of its creative self, more self-realisation.’ The personality aims for an inward spiritual grace and unity. The principal operator in this process is the will. The personality is compared with a well-organized society. There is a central legislative and executive authority, which controls activities in certain directions. Some of them are consciously taken, but many more are the result of some subconscious decision level. The final aim is a wholeness and harmony, in which the contraries disappear. Smuts’ concept of holism has attractive sides. However, his journey through the development of life is – in its final conclusions – a dualistic construction. The definition of the holistic movement as essentially an effort ’to eliminate what is alien and adventitious and to conserve and develop what is pure and relevant to its ideal, and so to reach perfection’ is nothing but oppositional thinking. Efficiency and purity are noble and even modern characteristics to aim for, but they are subjective and time-bound. As final aims in life they are bound to restrain the mind in an oppositional cadre. The hierarchic scale of humanization, as proposed by Smuts, places the lower and earlier position of mechanism against a higher and later rank of holism. This pellucid development (or evolution) from the physical brine to the understanding human personality is, in his view, an all-compassing trend towards a self-development. However, a critical observer can pose the question why holism is a more fundamental concept, which ‘in its most far-reaching reactions tends to transform, transcend and absorb the concept of mechanism’? It may well be, that Smuts described here, in a somewhat different setting, the very transition from dualistic to quadralectic thinking. That one great conceptual step is an enormous one, reaching for vast horizons. The holistic evolution from matter to personality seems to reflect the characteristics of an evolution in division thinking from one to four. The physico-chemical soup is comparable to the one-division, in which everything is in everything. Matter is present in an amalgamated form, but is not materialized in a context, because there are no distinctions yet. The subsequent organic separation from this primary brine is similar to the first (two) division, in which a boundary line is established. Matter and life are the same entities, but the fundamental difference is in the notion of division. The former is a concentration of atoms bound by physical force. The latter is a concentration of cells, held together by a holistic force. The psychical factor adds a dimension to the primary division of cells. It can be compared with the thinking in a three-division, operated by a mind. Organic units are able to devise a system of an internal shift and a subsequent valuation thereof. Finally, the personal stage represents the world of the four division, in which the valuation system is balanced and geared towards the covering of large fields of information and an effective use thereof. Holism, in a modern sense, should not be seen in Smuts’ original intention as a way to higher self-fulfillment. The emphasis on the anthropocentric element in his philosophic viewpoint leads to ourselves, but at the same time to nowhere. The intention of a subjective approach to life – fueled by the personality – is much more realistic. The whole, as a philosophical entity, has a distinct place in a quadralectic world view. It fits in the four-fold sequence of I. unity – II. muun – III. part – IV. whole, describing the same area of the universe from a different point of view. The whole is the representative of unity in the Fourth Quadrant. The whole merges in the unity of the (following) First Quadrant. The cycle can start anew (fig. 24). Only the description of the road of being remains open, said Parmenides. That is exactly what the teaching of Lao Tzu tried to convey in the longing for completeness and spontaneity of the origin. The Tao (meaning the immeasurable ta) of being, is a living and creative totality without a form or name. It encompasses the great emptiness, the one, and the nameless origin of heaven and earth. In the beginning is nothing, just a dimensionless unity (LÜHRS, 1986). Fig. 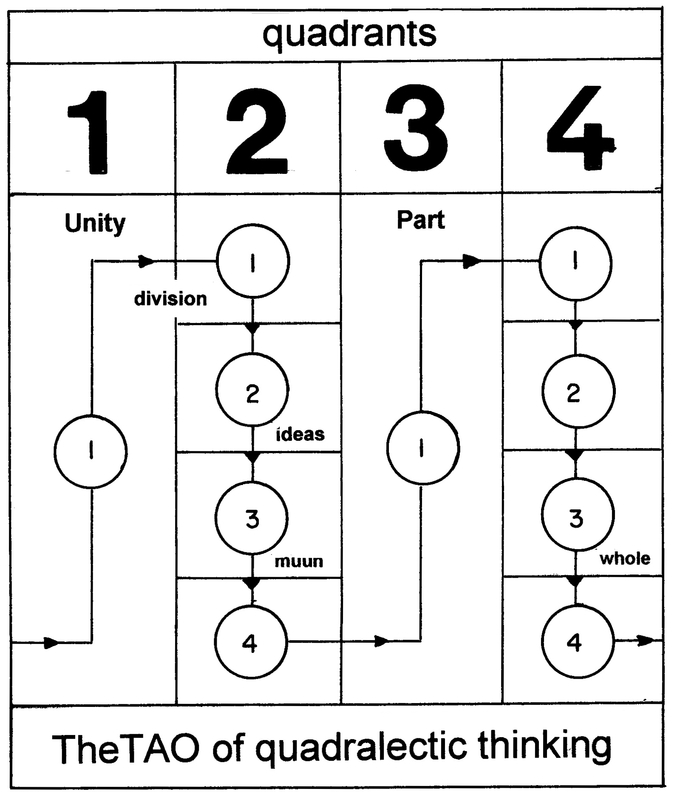 24 – This scheme gives the thinking path (or Tao) of a cyclic-quadralectic communication through the quadrants. The first and third quadrant have only one conceptual position (unity). The second and fourth quadrants are divided into four-divisions, which reflect the major division. This testimony was Jung’s explanation, translating the meaning of the ‘head’ into consciousness and ‘going’ into ‘a way’. However, another explanation is possible if the basic two signs of the Chinese character for tao are explained in a different way. The signs might refer to the fundamental elements in a communication: division and movement (see p. 15; fig. 4). The ‘head’ is, in that situation, the initiator of division (thinking) and the ‘going’ is the equivalent of movement. The concept of Tao is, from the quadralectic point of view, a representation of the ‘Ultimate Communication’ in which a (conscious) sense of division is paired with an abstract mechanism of movement. The Tao is explained as being within all things. It can be seen as a dialectical synthesis, superseding the contradictions (of oppositional thinking). It is also important in the ‘wu-wei’ (actionless-action) attitude towards the environment, by accepting and not interfering with the movement of nature, on the one hand, while using at the same time its advance towards action on the other. This two-fold aspect was pushed forward by another founder of Taoism called Chung Tzu. He saw – some hundred years after the explanations of the Tao Te Ching by Lao Tzu – the object of cognition in the dialectic of the single and the plural, the absolute and the relative and the constant and the changing. This element of contradiction is present in all things (yin-yang) and a movement of something towards its opposite is a strong convention in Taoism. A repositioning of Neo-Taoism, which took place around 250 BC, was in itself a split in two oppositional direction: the revisionists (led by Wang Pi and Kuo Hsing) moved towards Confucianism, explaining it as the fulfillment of Taoism in a practical sense and the hedonists (or romantic Taoists). The latter were known as the ‘Seven Sages of the Bamboo Grove’ (led by Chi K’ang), teaching an evasion of duty, a critical attitude towards conformity and a general following of impulses and stimulants. Modern Taoism can still be divided into two categories. Either the materialist philosophy of its three founders (Lao Tzu, Chuang Tzu and Lieh Tzu) or the later conversion of the revisionist movement into a religion (Tao-chiao). The contemporary (quadralectic) perspective considers the materialists- and spiritual sides of Taoism to be expressions of two different ‘holistic’ viewpoints in the Fourth Quadrant (aiming at the invisible invisibility of the preceding or following First Quadrant). The materialists find their place in the third division of the Fourth Quadrant (IV, 3), while the spiritual minds are gathered in the fourth division (of the Fourth Quadrant; IV, 4). It seems that different cultures find ways to express the same journey through life in the concept of what Smuts’ called the Whole. Holism and (original) taoism have their dedication to describe the invisible in common.